Customers need to be able to find your site, and without SEM and SEO they won’t know your site exists. Search Engine Optimization (SEO) – Optimizing your website and products (by adding keywords, etc.) to make it easier for Google and Bing (or any other search engine) to find them. Search Engine Marketing (SEM) - Spending money to get your website or products found on search engines at the top of the search – common terms for SEM you may have heard are Pay-per-Click (PPC), Google Adwords and Keywords. 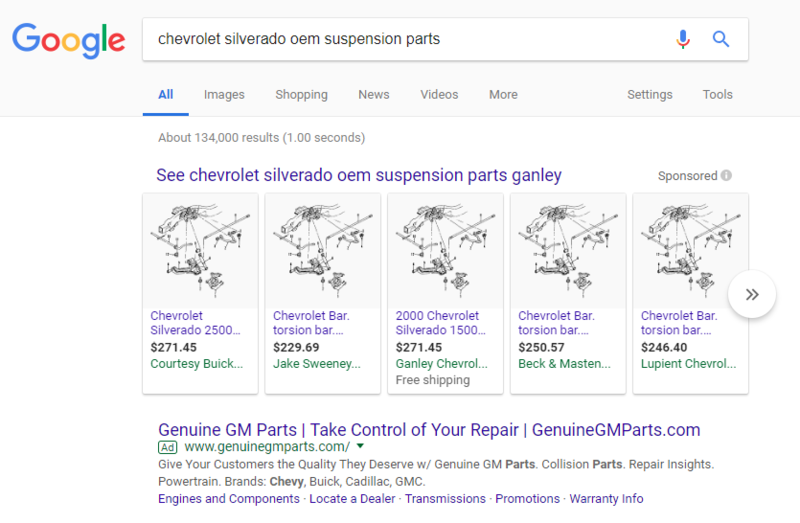 Why do SEM and SEO matter for selling parts online? Search Engine Marketing (SEM) and Search Engine Optimization (SEO) are two of the most important things you can do to sell parts online. Customers need to be able to find your site; SEM and SEO lead them there. A new bakery opens up in your neighborhood. The bakery finds a location, invests in all the baking equipment and starts making baked goods. However, this bakery doesn’t tell anyone where the store is located, they don’t put any signage on their storefront, they don’t tell anyone what they sell and they don’t tell anyone they’re open. How do customers find this bakery? They don’t – and the bakery quickly goes out of business. By investing in marketing for your online storefront, you’re telling potential customers exactly where your store is, what you sell and that you’re open 24/7. This is what a search engine marketing plan does for you. 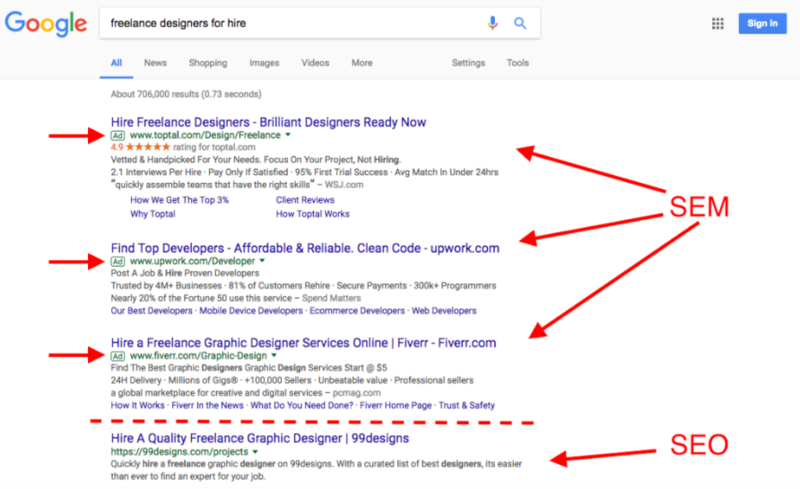 In the example above, the SEM arrows are pointing at links that companies have paid Google to ensure they show up for this specific search. SEM will typically show up higher on the search page than SEO since these are paid ads. The SEO arrow is pointing at a link that is showing up organically, which means the link is based on many different factors (relevance to the search, keywords used on your website page, how long the page has existed, etc. ), but what is most important to note is that SEO links that show up are free (not ads you paid for). What’s more important, SEO or SEM? The answer is they are both important. SEO is important because it helps your site appear, or rank, in search results whether you are paying to be seen or not. It’s like putting your store in a prime location with lots of foot traffic and having customers spread the word about where your store is located. With the right ecommerce solution, you don’t have to think about SEO. The web pages are automatically optimized for search results without the need for you to manage this yourself. Additionally, the right ecommerce solution will handle mobile optimization, making sure your site looks good on mobile devices and tablets. As more and more customers shop on their phones, mobile-friendliness is becoming increasingly more important. Google recently announced they are prioritizing sites that are mobile responsive, so your site will rank higher than sites that don’t adjust for phones and tablets. Again, the right ecommerce solution will automatically handle SEO in the background. SEO is important but SEM is how to really drive sales when it comes to selling parts online. You need your parts showing up at the right time, in front of the right customers. Without SEM, especially in the beginning, you will not have much success. Read more how your SEM budget should be spent. 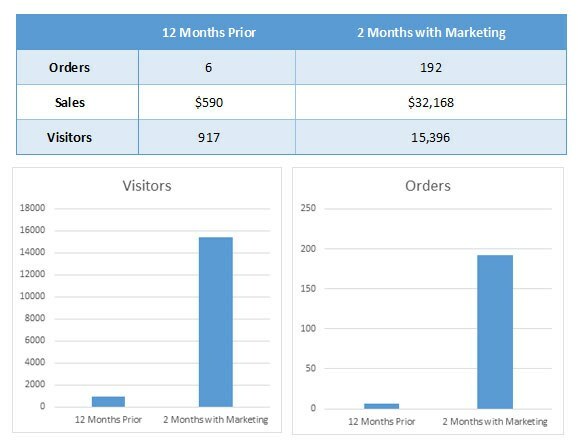 Before implementing a SEM strategy, this dealership was selling online for 12 months without much success. They had a total of six orders. Not good. They decided to try an SEM strategy and sales immediately increased. In just two months, they had 192 orders. Keep in mind, these are extraordinary results and not every dealership should expect this sort of return, but it’s clear these results were possible after implementing a SEM strategy. There are a LOT of people shopping on the web. SEM exposes your website to them. With SEM, you can market your parts anywhere in the country, at any time and can target specific locations and demographics. This is important for selling parts online because of the different trends in different markets. Certain parts might be in higher demand in different regions of the country. No one in Florida is looking for snow tires in December, but a lot of consumers in Montana are. Don’t forget: Just because you have the ability to sell anywhere doesn’t mean you should ignore your local market. Sometimes dealers develop a strategy to “own their backyard” before they actively expand into other areas. It all depends on your goals and how you want your ecommerce business to grow. The key takeaway here is that SEM and SEO are important if you want to create a new, significant revenue stream for your dealership. While it’s important you understand why you need SEM and SEO, you don’t need to be an expert in implementing these practices. Parts Departments have too much going on for you to have an SEM/SEO expert on staff. The right ecommerce solution will handle this in the background, allowing you to focus on simply selling parts. Create a huge revenue stream for your dealership and open up your parts department to a completely new set of customers. You can fish with bait or cast a large net. Here is why we recommend fishing with bait.